“Nakaragi no michi” is the section of the path in front of the Kyoto Botanical Garden, at the hiking trail along Kamogawa River from Kitaoji-bashi bridge. The cherry trees here are all weeping cherry blossom called “Beni shidare sakura”. 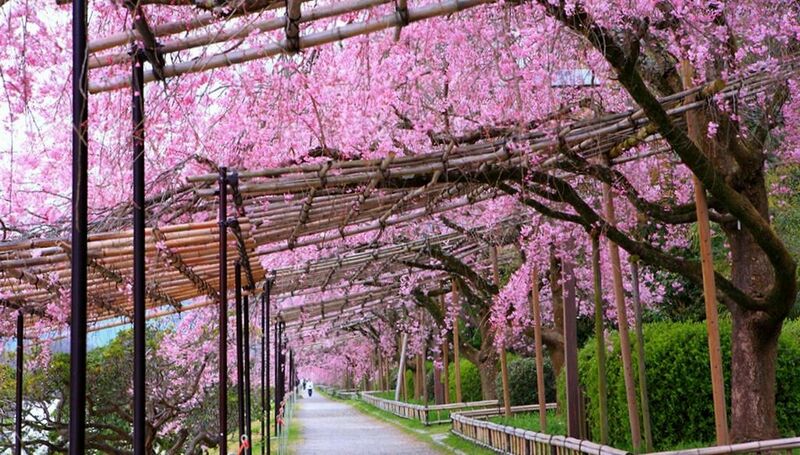 Their branches hanging across trellises makes a cherry blossom tunnel, lining along the Kamo river over 800m. The blossom is a deep pink and is quite different from the iconic white petals of the “someiyoshino” trees. It will be fantastic walk along the Kamo river in Spring around the early April to the Mid-April.